Crazy busy has had me swamped unable to really get around to updating this. This month I went back to basics for the We <3 RP event. Brand new sorta kinda. An update really. A redo of something that I don’t know is a favorite of everyone else but I love it. My wood chopping chore. I know, something so basic… a favorite? Eh well it’s because it’s one of the fun ones. It has an animation that runs through a sequence. Pick up the wood… walk around the stump…. place the wood on the stump…. move to the side and CHOP! As the swinging axe comes down two pieces of wood fall to either side of the stump. It’s all managed brilliantly with some simple scripting so it looks like you’re actually doing the work. The pieces appear or disappear as needed, you go through the sequence and you can feel like you’re actually doing something. It can be the little things that give me a giggle. Of course I’ll never admit to -actually- giggling so don’t ask. The set is kinda like the older one with sculpts. 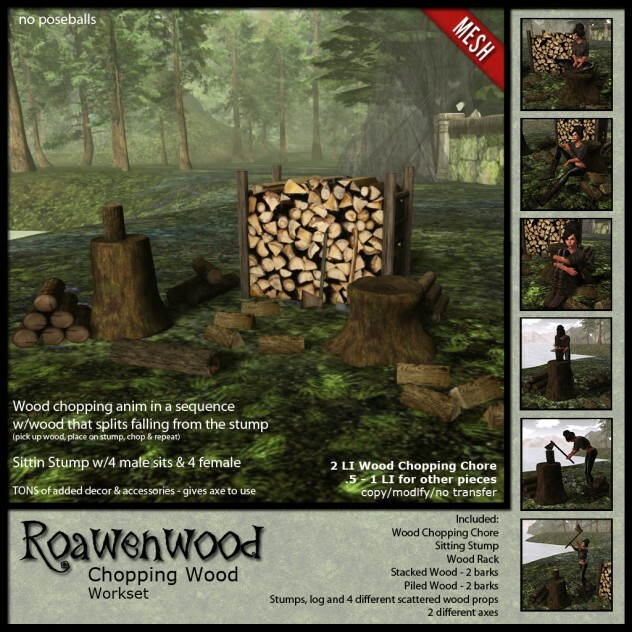 Chopping wood chore, a sitting stump with 8 total embedded animations for you to use or relax with, then the various accessories. Two axes, a wood rack, various types of scattered wood, some piled wood, that sort of thing. You can really make a nice little scene or area, since it’s all copiable then you can do what you want. One VAST improvement over the old one. I fiddled and got the script to work so there’s NO POSEBALL! Omg you have no idea how much that annoyed me in the past. So, there’s no poseball, just sit on the stump… it gives you an axe to wear and off you go. 100% mesh content, with pure awesomeness abounding. See it in world at the new arrivals section… at least part of it…. at my main location. To purchase you MUST go to the We <3 RP event for this month. AFTER that it will be in the store but for now that’s the only place you can get it. Wanna hear another bit of cool? It’s discounted! ONLY 315L through the month, afterwards it will have a price adjustment. Enjoy and happy chore… chopping… stuff. Posted in: Chores & Work, Gor/Gorean, Landscaping & Prefabs, We <3 RP!